Še ena slika iz kolekcije Ching Chou Quik, ki me je prevzela. Sponsorsko štampiljko Butterflies and Berries sem z užitkom pobarvala za nov izziv pri Colour Crazy teamu. Kot vedno lahko naredite karkoli, le lastnoročno morate pobarvati sliko. Glede na vreme, kakršno je zadnje čase pri nas pa je barvanje prava sprostitev. Vabljeni torej, da se nam pridružite pri novem izzivu. Hello dear friends! I am with you again with my new card. I used digi stamp called Butterflies and Berries from Ching Chou Kuik collection. Love this stamp. Isn´t it gorgeous? - Kleuren met Potloden: ATG, avg. 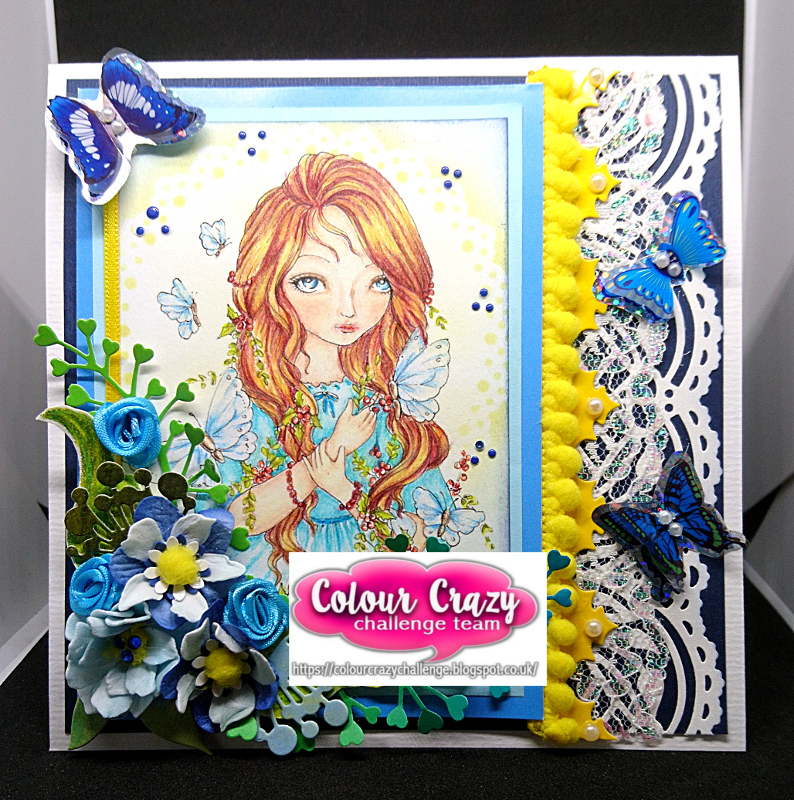 A beautiful card Marjeta, a gorgeous image and lots of pretty details. This is gorgeous! Beautiful image and layout! Such pretty flowers and butterflies too! Thanks so much for sharing this with us at Penny's Paper-Crafty Challenges! It's a really lovely image and so prettily coloured and embellished, many thanks for sharing a favorite stamp with us at Stamping Sensations challenge. Wat een prachtige kaart met een schattige digi. Mooi ingekleurd. Gezellig dat je meedoet met de Challenge van Kleuren met potloden. This is gorgeous Thank you for sharing with us over here at "A Perfect Time To Craft" and best of luck with your entry. beautiful work Thank you for sharing with us over here at "A Perfect Time To Craft" and best of luck with your entry. Wonderful card. Thank you for joing us over on the Angie's Digital Stamps Blog. Good Luck! Lovely colorful card! Thanks for joining us at Scrappelyst!